A run is a must-have accessory for all rabbit owners. Our folding runs will give your rabbits the opportunity to get out and get some exercise safely and contribute to your rabbit’s health and happiness. The Home and Roost folding runs are perfect for what we like to call the “Pop up Sanctuary” Unlike similar runs that are designed to stay made up all year long, our foldings runs give you more flexibility. 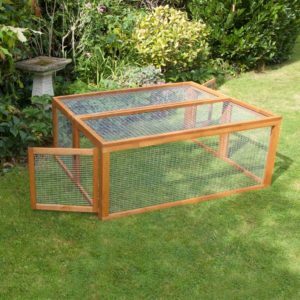 Folding runs are great for the loving pet owner who doesn’t necessarily have the permanent space but know how important it is for your bunny to get out and feel the grass under their paws. 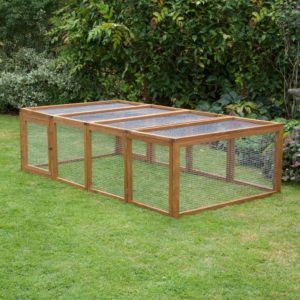 These runs fold up for winter storage but can be quickly erected to give your bunny a place to run and play. 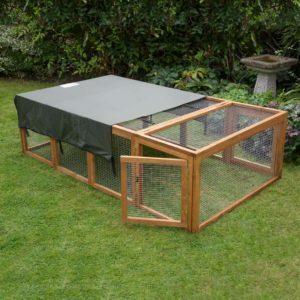 The folding runs come equipped with multiple doors as well as a screen top to keep your rabbit in and predators out. Home and Roost are the only retailers in the pet industry that are part of the Made in Britain Campaign, and as such all of our runs are made in the UK. We only treat our wood runs with animal safe preservatives to keep your rabbits safe and healthy. This treatment will help prevent rot and serves to waterproof the timber. All of our folding runs use galvanised screens with holes of 1 inch or smaller. This helps prevent your bunny buddy from getting caught in the mesh and keeps predators from being able to reach in. All of our runs are designed to help your rabbit enjoy their time outside and get plenty of exercises. This is important to promote health and keep your rabbit happy. Exercise is especially important to prevent your rabbit putting on excess weight. In the wild rabbits like to move around and are quite active and the Home & Roost rabbit runs help to mimic this environment. Runs provide rabbits with a chance to enjoy nibbling the grass and to explore a space outside of their hutch. This is great stimulation and keeps them happy, healthy and can prevent them causing mischief later. Home & Roost have designed our runs to be lightweight and easy to move. This helps protect your grass from being damaged by a heavy run and means it can be moved regularly to rotate the grass and prevent your lawn from being nibbled too far down in one place. 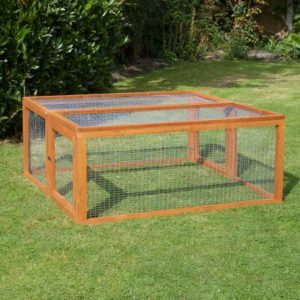 You can give your rabbits a new place to roam each day, keeping their minds active and preventing bunny boredom. If you treat your rabbit, you can pair some of our great boredom buster toys and chews, with your run to keep your rabbit occupied for hours. We recommend including a run shelter, run shelter in your folding rabbit run. This gives your bunny somewhere to hide and helps them feel safe. Finally, you should always use a run shade if it is a warm day as this offers your rabbit a reprieve from the heat.